GREENBELT, MD-When hospitality is in the blood, sometimes you just have to go with the flow. For brothers Kim and Chris Sims, president and EVP, respectively, of Chesapeake Hospitality, the pair has been engaged in some form of lodging for most of their lives, giving them what they feel is an advantage when it comes to third-party management. As next-generation managers of the 60-year-old organization, the Sims brothers were “hotel kids” before they were “hotel guys,” helping out in their early years as they made their careers in the industry. Formerly owner/operators, Chesapeake Hospitality (CH) now focuses solely on third-party management, with 29 properties representing approximately 5,300 rooms under contract with 13 ownership groups, with both branded and independent hotels in the portfolio. Most recently, the company assumed management of the 250-room DoubleTree by Hilton Hotel Syracuse in New York. Chesapeake plans a $5.6-million renovation of the full-service property, which is near Syracuse University, the Carrier Dome and regional mall Destiny USA. The rehab will include public spaces (ballroom, restaurant, bar) and upgraded carpeting in the guestrooms. “We keep the number of properties that our management team takes care of very small [about eight hotels], much smaller than our competitors because we want to give a high level of service to our ownership groups. We don’t want to overextend our management team in the field,” said Chris Sims. That said, Chesapeake Hospitality added five properties in 2015. 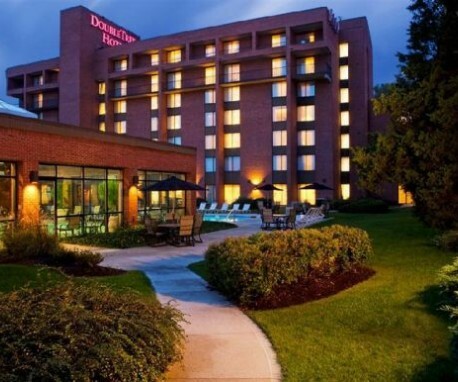 These included a 117-room Four Points by Sheraton Louisville Airport in Kentucky; 160-room Holiday Inn Milwaukee Riverfront; Crowne Plaza Memphis, TN; Holiday Inn Wilkes-Barre, PA; and the Days Inn Harrisburg, PA. Bringing in hotels that also complement the portfolio’s goals is likewise important. For example, the Pennsylvania properties (via the same owner) are good fits from both a geographic standpoint and Chesapeake’s previous experience with Holiday Inn product. Similarly, the Memphis and Milwaukee hotels are under the same owner (who also owns the Syracuse DoubleTree). The Wisconsin Holiday Inn, formerly a Hilton, underwent an $8-million renovation, including guestrooms, an expanded lobby and a new bar area that features views to the river. “I think because of our relationship with the ownership group and the results that we showed in Milwaukee, he felt very comfortable with us moving forward on additional projects. The Crowne Plaza, in particular, is kind of a sweet spot for our company; we currently manage seven Crowne Plazas, so we know that brand very well,” said Kim Sims. In the case of the Four Points, the CH team originally approached the owner, but he went with another management company, although, interestingly, he stayed in touch with Chesapeake. “He maintained contact with us even during that time period, asking our GM for assistance because he wasn’t getting it from his management company, so it was an ongoing relationship,” said Chris Sims. Chesapeake now also manages a Sheraton in Louisville for the owner. “It kind of gets back to our philosophy in keeping our portfolio size down for our corporate people. He wasn’t getting the attention, the communication and the assistance from this other management company,” said Kim Sims. The president also knows the company’s comfort zone is in full-service, although he doesn’t rule out the right opportunity vis-a-vis select-service. “We learned a lot of lessons in the past three or four years, where we took on a lot of select-service properties. It posed different challenges for us here in the corporate office. Not that we don’t excel in the select-service markets; I think we do. But it really put a strain on corporate [because] a lot of the select-service properties can’t afford the infrastructure for an HR director or a controller or a director of sales, necessarily. So, a lot of those type of wants or needs for the property fell back on the corporate office,” said Kim Sims. The company additionally weights its third-party-managed portfolio with brands, although it currently manages three independents, including the historic Georgian Terrace—a member of Preferred Hotels & Resorts as well as the National Trust for Historic Preservation’s Historic Hotels of America—in Atlanta. The other two properties, the Fenwick Inn and the Beach Plaza Hotel, are located in Ocean City, MD. Chesapeake’s president also sees opportunities among the new soft brands emerging from a variety of hotel franchise chains. “There are cases to be made to be a brand and cases to be made to be a soft-brand independent and some to be completely independent. I think our expertise goes across all disciplines as far as that’s concerned,” said Kim Sims. And, even though the lodging landscape has changed in terms of more players and more offerings, Chris Sims indicated what owners want from a third-party manager—results—remains the same. “Our main things that we promise an owner are: increase revenue, minimize operating costs and maximize return on their investment,” said the EVP. “The expectations of the owner, most of them are bottom-line driven,” agreed Kim Sims, but added he’s also seeing a desire for more communication between the ownership group and the management company—and limiting surprises. “The last thing an owner wants is a surprise, especially if it’s going to be a negative surprise,” he said. The executive noted, “RevPAR for the ‘estate,’ was up 6.8% [in 2015], and we continue to increase the margins,” adding the company also strategically strengthened its purchasing platform and its corporate team to better assist in driving results for the ownership groups. This included adding a director of e­commerce and digital marketing. “And we’re seeing very good results from that department,” said Kim Sims. As for 2016, the president observed owners are starting to revise downward some of their expectations. “I think that’s correct. Whether we have another 18 months or so before things start on the downward cycle, they want to make sure they know where they’re going to be when that goes down,” he said, noting he’s been through four downturns over the course of almost 40 years. Chris Sims suggested the need to be proactive with a downturn looming somewhere in the future.